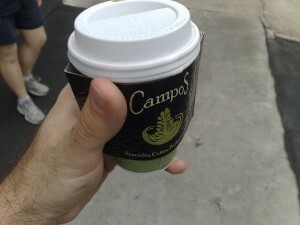 Campos is located just next to the James Street Market, though you would not know it if you were there. There is no way to walk straight from the James Street Market to Campos. You have to walk back out onto the street to get there. I can only assume that this is to encourage the dozens of people spending their money there to go to Spoon instead. Shame that Spoon is not that great. Back to Campos. With their alleyway location and nifty fake plastic grass and crates, it is a cool little cafe with a bucketload of character. My takeaway long black, made on their own dark roast blend, was good. It tasted fine and did not lose too much for being served in a paper cup. Coffee in hand, I continued to wander around for a bit longer. If it wasn’t for the crowd, I would have stuck around for breakfast too. A decent cafe, if you can get a seat. The coffee is good and it is out of the way sitting off Wandoo Street. Better than Spoon as far as the coffee is concerned, and cosindering the size of the servings that Spoon does, it can’t be too much worse for food.